The Peculiar Treasure: Happy Thanksgiving From The Peculiar Treasure! 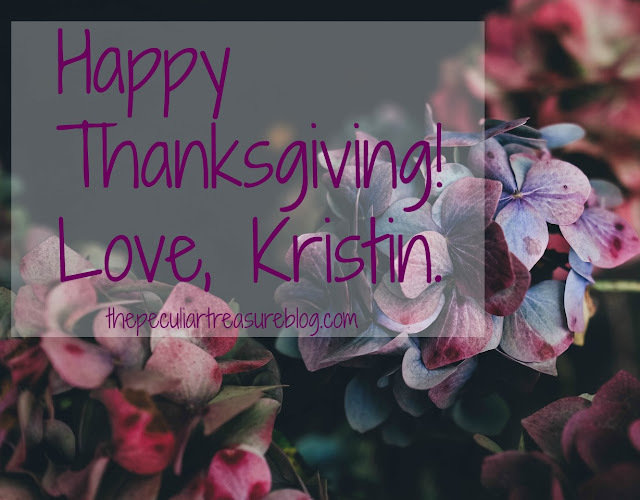 Happy Thanksgiving From The Peculiar Treasure! Happy Thanksgiving, you wonderful people! I know you are ready for your turkey, stuffing, and cranberry sauce- and I don't blame you. But before you shut you laptop and head for the table, I wanted to encourage us all to truly live a full life of thanksgiving, not just this one day a year. Earlier this week, I was reading She Reads Truth. The series was about giving thanks to God, and the particular post was about God winning the victory (read it here).The text for the post was Psalm 98.
with the lyre and the sound of melody! make a joyful noise before the King, the Lord! the world and those who dwell in it! When I read those verses and then started thinking about the study questions, I realized something: these people are joyous about the victory God has given and they truly know the way to share it with the world. That is why they are singing. And though I don't need to carry a harp around everywhere I go (thank God! ), I do need to show my thanks to God outwardly. What good is it to have victory, if no one can see the joy in my life? If we walk around depressed, angry, anxious, or fill-in-the-blank, we are not portraying any sort of victory to the world. In fact, we are making the great hope of Jesus into something that is less than desirable. I'm not declaring that we should be fake or pretend we have no problems. Rather, I am declaring that despite our struggles, we choose joy and we live it out. So on this Thanksgiving- better yet, every single day- give thanks to the Lord for His victory by living a joyful, thankful life. Show the world what we have through the praise of our lips and the joy in our actions. Give thanks to the Lord. His love endures forever! Love this thought process and idea. Give thanks all day. Happy Thanksgiving to you too! Beautiful lyrics! I love this song! Thanks for reminding us what the true meaning of the holidays are! Great post for Thanksgiving. I hope you're having a wonderful day! Wonderful post! We had a wonderful Thanksgiving and definitely gave thanks to Him first and foremost. Thanks for the reminder and hope your day was just as great! Happy belated Thanksgiving to you, and have a blessed holiday weekend.